Would it be better to post bugs/feature requests here in the thread or in the tracker on bitbucket ? your fine component would show only those releases, related to their master release. I think, both, the discogs-servers and the users will benefit from this addition, because we do not need to load all releases (speed ups) and then can easily chose from a master-list which release we want to tag our tracks. I'm not sure, I understood what you're trying to accomplish, but I read zoomorph stated $pput and $pget, but you trying to use $put and $get instead? I never have worked with those, so I cannot tell if one might be of better use. which does not list $pput or $pget as available at all. My main problem is understanding caching discogs API/server data to be used for other fields within foobars' scritpting/formatting syntax, and/or, constructing multiple nested IFs. What you're asking about should be pretty simple. The "featuring" value is already calculated in DISCOGS_CREDIT_FEATURING. Use $pput() to save that to a variable, make sure that tag formatting string is higher than TITLE in the list, and then use $pget() to retrieve it in the TITLE string. You can find info on $pput() and $pget() in the foo_discogs HTML help page which is accessible by clicking "syntax help" on the edit tag mappings dialog. These functions persist across all tags for a file whereas builtin $put() and $get() only persist across a single tag formatting string. It's a big one IMHO, I only had it a few times the last year(s), but now I could reproduce it. Please see the attached animated GIF. This bug is similar to reproduce. search for "Andy Ash", filter "White Leaf". Open the release, via Next-Button and then go back via Back-Button. Click again on "Andy Ash", in the results list, or type something in the filter-window, or just click the Search-Button. Strangely I can't reproduce this one. Note that sometimes country is or is not included in the format field coming from the Discogs API (but it shouldn't change like that). Posting in this thread is fine. Interesting suggestion although I think it would have limited value. 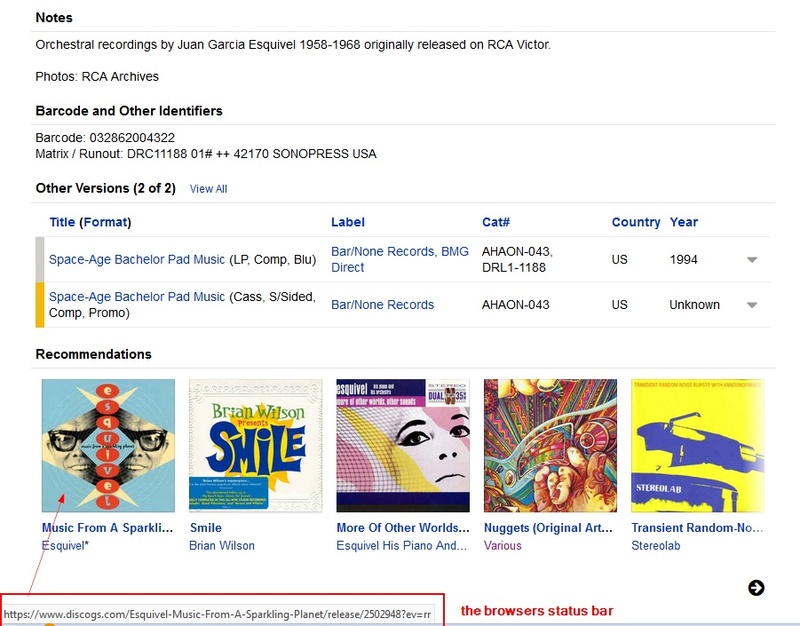 If you are already on Discogs master page, why not just find the correct release ID while you're there? You could add it to the issue tracker if you want me to think about it more and consider it if/when I get time to add more features. Sweet, that sort of makes sense. Thanks! and could be cached into a pput variable, to be used with pget on the TITLE formatting...? I tried exporting as well (to no .ext, as well as .txt, .csv & .xml) but nothing seems to give me anything I would have control over the field order, seemingly. csv in UTF-8 did show some ascii, but the fields/separation was all busted. No success with any of the others, which were just binary and did not give a hint as to what .ext these exported mapping files are meant to be...? Mind you, I'm on an old foo_discogs... 2.14 from the looks, in case some sort of re-ordering functionality came in later versions. "(FATAL) Error: Error generating tag TITLE [Corrupted array string: missing start byte] for file file://D:\bla\bla.flac"
Any ideas / suggestions would be muchly welcome. - Fix $filter() function not removing empty strings from array. - Fix $pput() and $pget() to operate per track as expected, rather than per release. - Fix filtering on expanding master release on find release dialog. There's no way to reorder the tag list but you can delete a tag and add it at the bottom. If you want to clear a "temp" tag, you can define the same tag again later on with an empty tag formatting string. That will delete it. I encountered a couple bugs on the way which were fixed in 2.19! Awesome, thanks for fixing those bugs which I wouldn't have ever be able to identify as such, and updating to 2.19 !!! Whereas as explained by zoomorph above, the last 2 need to be 'empty' in order not to write the temp variable into an actual tag field. Thanks a ton @zoomorph ! Yup. And you don't actually need any temp tags, you could just put it all in one tag, unless you find it too unwieldy. I used to work with older versions with no problem. Latest 2.18 and 2.19 though, doesn't allow me to authorize. The OAuth process hangs and then I get "Error: Network exceptionNetwork authentication error (80090302)". 1. Your system clock must be set correctly for OAuth authentication to work. 2. As of mid-2018, Discogs requires TLS 1.2 support to access its API. Thanks. TLS was my problem. Once enabled, it works. I love this plugin and I've used it to tag quite a few CDs now. But what I really want to do is rip and tag my entire CD collection (including over 1,000 double CD compilations). The trouble is that the plugin takes time to download the release lists for each CD, so it just isn't possible to process so many CDs. It would require me to spend about a solid month working 8-hour days just sitting and waiting for release lists to download! 1. Batch download the release lists of multiple albums, ready so that tagging can be done later. 2. Send all artwork downloads to a queue in the background. there now is a new smallish, but inconvenient bug, which came with this update. It mostly finds attention, when the list of releases is very long, for example, take the beatles or m. jackson. Wenn you expand a master release (say, at the bottom of the list of releases), the focus/cursor/pointer jumps back to the first entry in the list. So the user needs to scroll all the way down to that expanded master release. Which is, if you want to expand multiple master-releases, a bit annoying. On the other hand, this bug is very handy too, because if you want to expand ALL master releases, you just need to hold the cursor down key for 10 minutes and the fine component will open all the master releases. One after each other from the top to the bottom of the list. I re-tested it against Version 2.19 and it is reproducable. Please see the attached and (poorly) animated GIF. Maybe it helps to reproduce it yourself. Just click/type around, *after* you came back from the Match Tracks window. You then will see the UK, which is not there from the beginning. And, of course, you need to restart f2k or reset your cache. Btw, while we are about links (and convenience aka lazyness or inattentiveness), would you mind to let the fine component strip/remove the "?ev=rr" from a link, pasted into the "Release ID / URL" field? Apologies if these questions have already been answered, I would like some help with the following 2 questions please. Thanks again for this brilliant component! You can do this. You could do it in your skin's configuration, but I agree that it's annoying having redundant 1/1 for those values! Go to Edit tag mappings, which you can get to from various parts of the Discogs tagger dialog. Second one looks like something that @zoomorph might need to look into. There are no options for batch processing (until you've already tagged them once, then you can use the Update Tags feature). foo_discogs could be slow for artists/releases with a lot of releases/versions as the Discogs API applies rate-limiting. Still, compared with the time it takes to rip CDs tagging should be quick. Excellent, works great, thanks guys! Not quite sure what's happening but the clear cache function doesnt seem to be clearing the cache. I tried using the script on a release which is multi-disc and had the wrong numbering format, so the script didnt properly detect it as a multi-disc release. I updated the entry on discogs to the correct numbering format (1-1 etc), I then tried tagging again and it's still detecting the old information even though the website has been updated. I tried pressing the 4 clear cache buttons in the caching tab on the script, then restarted foobar, and tried doing the tags again on the same release, but no change. The Discogs API caches the only info and sometimes it takes a few hours for the API to start returning the new info. Thanks for the fast response. I'm guessing they made changes to their API as I remember old versions of the plugin had a button to clear cache and it was pretty instantaneous when recognising updates to the database. I meant to ask before, is their a way of making the plugin detect multi-disc releases using the wrong numbering format? Thanks again for the plugin, it's such a godsend!